"I didn't care what happened, as long as I got high." A four-disc set like Addiction is like a video research book, a fascinating, depressing and tragic and ultimately informative look at the ravages of addiction, and medical study that is being done to help those who want to kick it. The main component here is a 90-minute HBO doc that utilizes an assortment of documentary filmmakers (such as Albert Maysles, Chris Hegedus, D.A. Pennebaker) to look at various branches of the broad subject, in small, bite-size chunks. We travel into an E.R. room, we learn about brain imaging and over and over we hear stories of lives forever altered by addiction, and the researchers seeking to understand the physiological components of what is now considered a treatable brain disease. It doesn't matter if it's alcohol, heroin or opiates, it's all covered in one way or another during the initial 90-minute doc, and then even more in-depth as part of the extensive three discs of supplemental material (see Extras). The main doc is split into 9 separate sections, each essentially a short film daisy chained together into a larger whole via transitional interviews and onscreen bullet points, though often the same researchers appear to discuss how the various areas of addiction work. This overall format does give it the feel of one of those educational films you had to watch in school, only this time the material is both dramatically hard-hitting and sadly compelling. With my long ago "experimental" days far behind me, as a parent of a teenager it was segments like A Mother's Desperation and The Adolescent Addict that were the most heartbreaking. Even as a social drinker and a supporter of marijuana decriminalization, it put a pause in my step as I watched "good kids" who fell hard down the rabbit hole, and maybe it reopened my eyes a little to things I need to watch out for with my own child. That's what this doc does so well, without preaching or screaming. It shows the effects and it shows what can happen, even to the "good kids". Kind of scary. The series tagline of "why can't they just stop?" is the recurring theme here, and in story after story we are shown why. Facts are presented, new medicines are tried, and sometimes the struggles are not won. With the gamut of filmmakers present, there is a very even keel to the overall narrative flow, with no one director branching off into any sort of experimental weirdness. It's an open discussion of a growing problem, told with a visual continuity that treats all areas of the subject�whether it be managed care/insurance issues or a parent forced to have her own child arrested�as integral parts of the story. This is another winner from HBO. Image Transfer Review: Addiction has been issued in 1.33:1 fullframe, though some segments are shown in nonanamorphic widescreen, while others are not. The print is very clean, colors are bright, and edges appear sharp and well-defined throughout. Audio Transfer Review: Audio is presented in straight-forward 2.0 surround, offered in both original English and a Spanish dub. Solid without being showy in any way, this delivers clear voice quality, even under a variance of filming locations. Extras Review: The four discs are housed in two hinged cases, inside of a cardboard slipcase. A ten-page insert booklet outlines the key messages of the series, as well as giving a quick description of the content. Disc one carries the main feature only, which is split into 11 chapters. Surprisingly, the disc three doctor interviews�especially Nora Volkow�are very compelling in their explanations of addiction, and while the thought of wanting to sit through four 20+ interviews may seem daunting, the information is presented in a very digestable manner. Dramatic highpoints�if you have insist on cherrypicking�can be found on disc two (The Adolescent Addict) and most importantly on disc four (A Mother's Desperation). In fact, it is this extended Susan Froemke/Albert Maysles piece (seen in part during the main documentary), in which a mother attempts to help her heroin addicted daughter, that is one of the most profoundly moving stories told across this entire series. 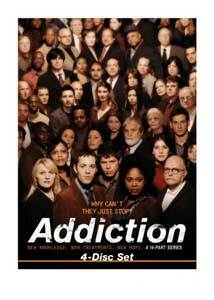 If you or someone you know has endured the struggles of addiction, this HBO doc will be particularly relevant. With three discs of supplemental material (in addition to the 90-minute documentary) there's a lot of educational material here, assembled by a wide range of filmmakers. File this one under informative educational resource.